Here in the following you'll get SHCC Jobs 2019 January Advertisement | Sindh Healthcare Commission announced for the Medical Field related individuals who are highly educated for the following vacancies. 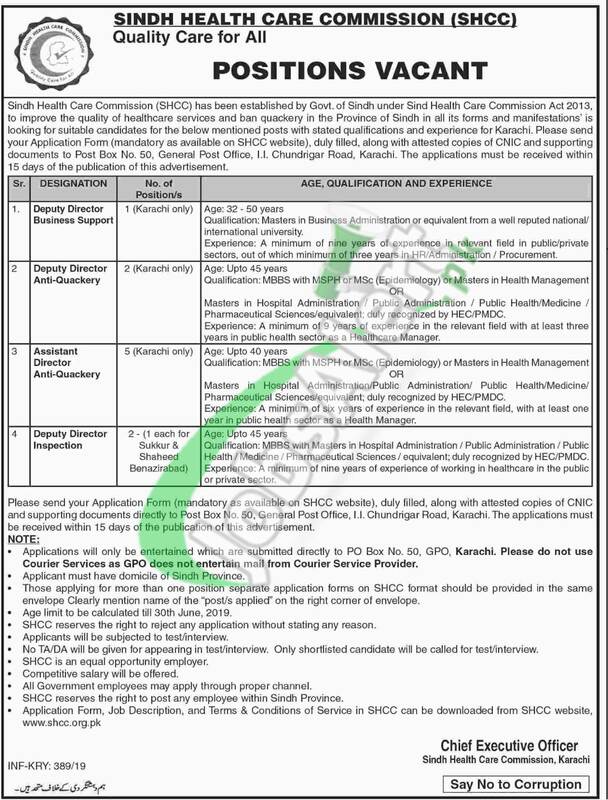 Jobs in Sindh Healthcare Commission to apply are such as (Deputy Director Business Support, Deputy Director Anti-Quackery, Assistant Director Anti-Quackery, Deputy Director Inspection) based at Karachi, Sukkur, Shaheed Benazirabad. Candidates from all over Sindh possessing qualification Masters/MBBS and relevant field experience are suggested to apply on prescribed form and submit it before the last date 11th February 2019.